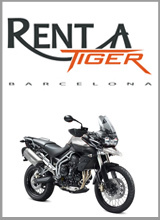 Being concerned about motorcycle riding safety, we have equipped all our Tigers XC with a preventive sealant to avoid the risk of sudden loss of control due to tyre punctures. The sealant can repair up to 95% of punctures, and it is guaranteed to be effective over the life of the tyres. It acts immediately at the time in wich the puncture occurs, repairing air leaks up to 6.8 mm wide. Even with the sealant in the tubes, you’ll be able to desinflate the tyres if needed. Just turn the wheels with the valves on the 12 o’clock position and proceed.